Replace the Longbranch Road Bridge over Fowlers Creek. The project will resolve structural and scour issues associated with the bridge and avoid future bridge closures. A bridge replacement project in this area will need to avoid or mitigate environmental impacts that may include historic sites. 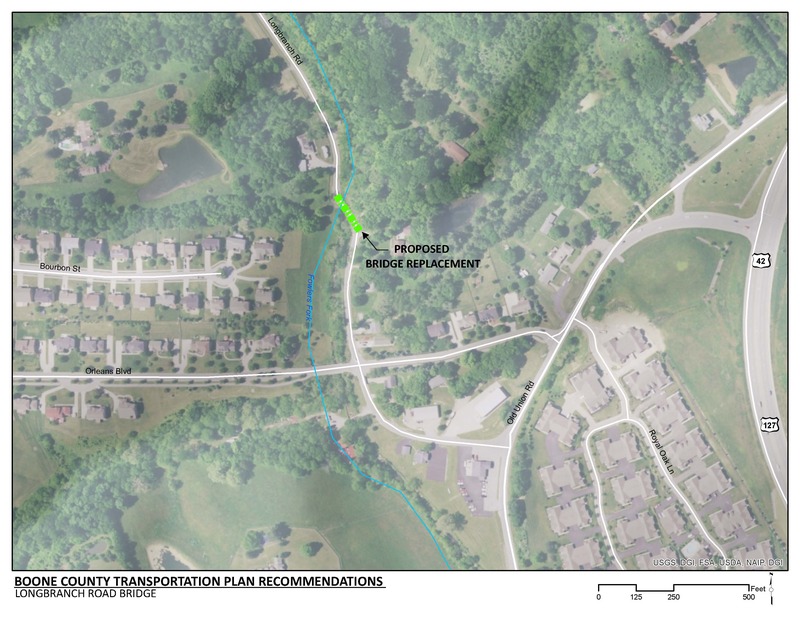 Additional right-of-way will be needed to implement this recommendation. The existing bridge is on a local roadway that serves rural density residential, agricultural and woodland land uses. There is one potentially-historic site identified near the project. The existing Long Branch Road Bridge has a sufficiency rating of 45.2 and is considered functionally obsolete. The deck, superstructure and substructure are listed as “Fair” condition. The bridge is located within a sharp curve on Longbranch Road. There have previously been measures taken to prevent scour or remove sediment such as sand and gravel from around the bridge’s abutments or piers. However, river control devices and embankment protection are damaged. Scour is caused by swiftly moving water which can create holes in the structure that comprise its integrity.